Welcome to the childhood world of our 43rd President, George W. Bush, and his remarkable family. Check out our President George W. Bush coloring page today! Please call 432-685-1112 to reserve spaces for your children. Literacy Program Sponsors: Whataburger, Diane Christianson, Midland Academy Charter School, The Texas Pecos Trail and Children's Dental Center. The Laura Bush Bookshelves are also fully stocked and ready for children of all ages to receive a free book to call their own. Come by during our normal business hours and pick out your book! Limit 1 book per child/day. You can also exchange your old books for new ones. New or gently used book donations are always welcomed. Drop your books off in our Gift Shop during our normal business hours. 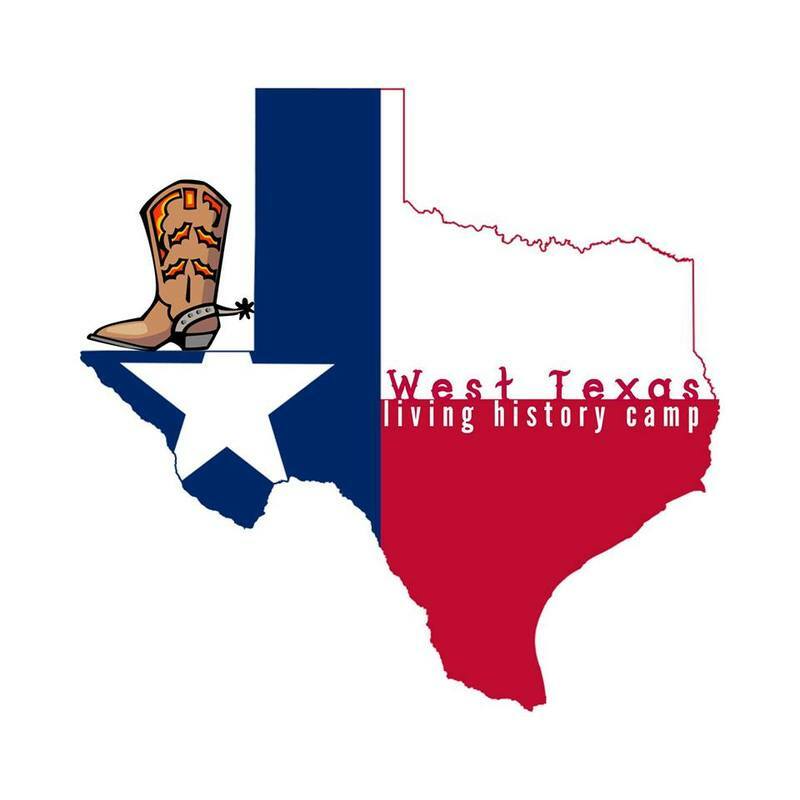 The George W. Bush Childhood Home and the Midland Texas Historical Society are partnering with You ASKED for it Character Programs and Weddings to bring you a one of a kind history camp that will knock your socks off! Join us as we learn all about the natives from the area, the Spanish involvement with Texas, Texas and the Civil War, all about the Alamo, oil barons, and much more! 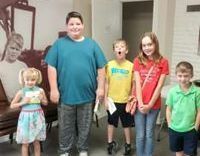 The goal of this camp is to get children excited about history! 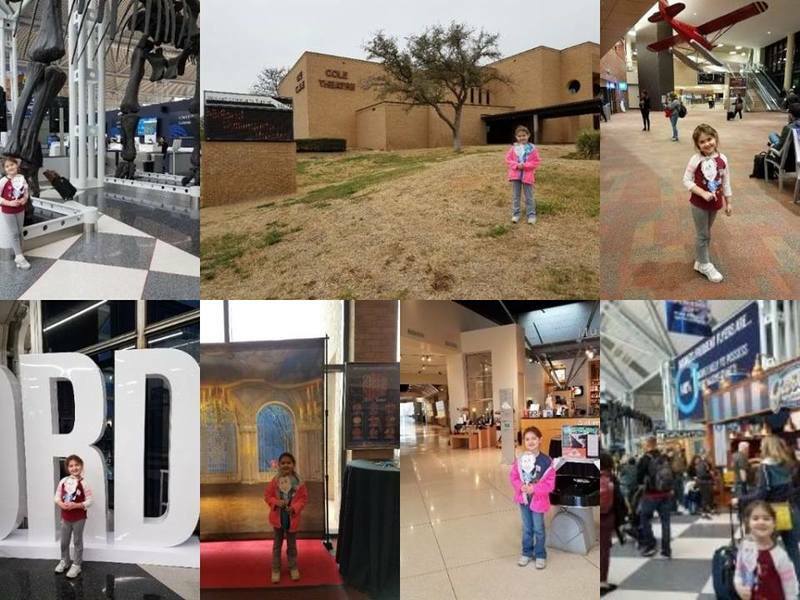 Children will have the opportunity to learn from local experts on native artifacts, presidents, and oil field history. Each segment will be accompanied by an arts & craft project, a story time, outside activities, and FOOD! On Friday, parents will be asked to attend a final program see everything their child has learned while at camp! You do not want to miss this camp, it is truly a one of a kind experience!.. and for just $25 it is a a great deal! Curriculum is geared for children 8-12. The camp will be held at the Midland Texas Historical Society building located at 200 N Main St, Midland, TX 79701 from 8:00 am to 12:00 pm. Flat George - Take him everywhere! Flat George is here! Download it, color it and take pictures of him wherever you go! Post them on our Facebook page. 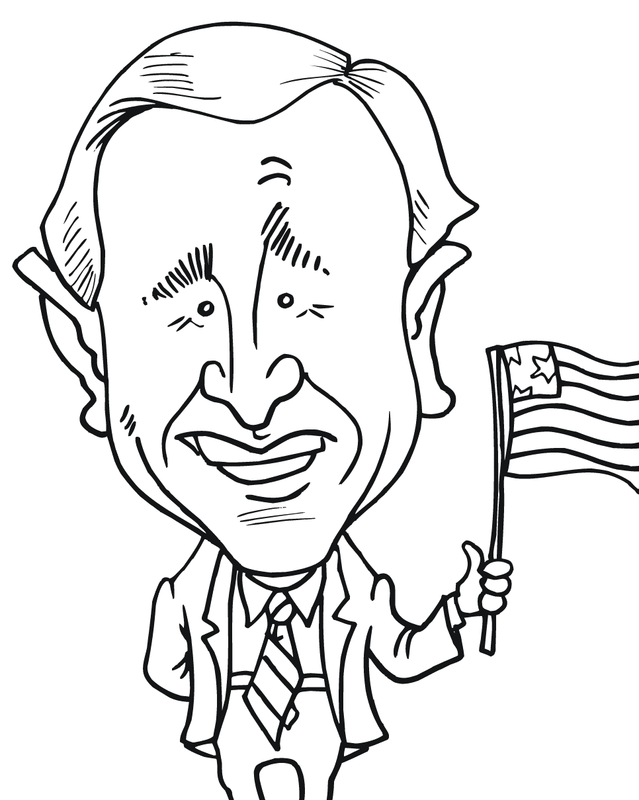 Click here to download your President George W. Bush coloring page today! Stay tuned for other great Flat George adventures! 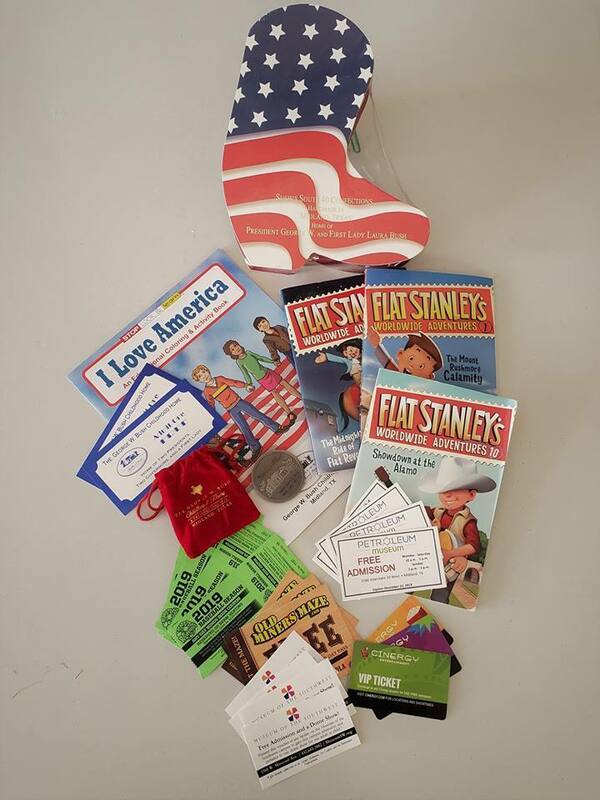 Congratulations to our Flat George winners! First, all of us at the George W. Bush Childhood Home would like to thank all of the children and their parents for participating! 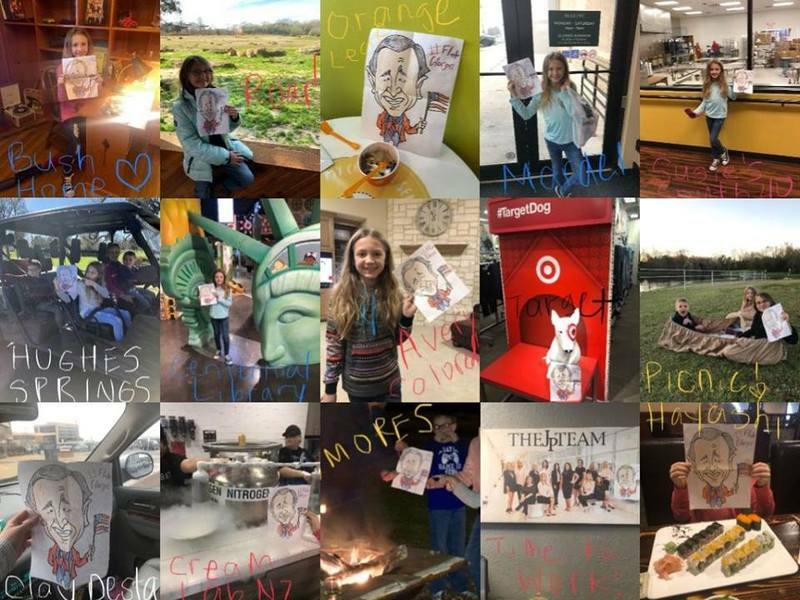 We had a lot of fun and it has inspired us to keep our Flat George Adventure going! After the contest is over, you can still take George on all your adventures and submit your story to our Facebook page. 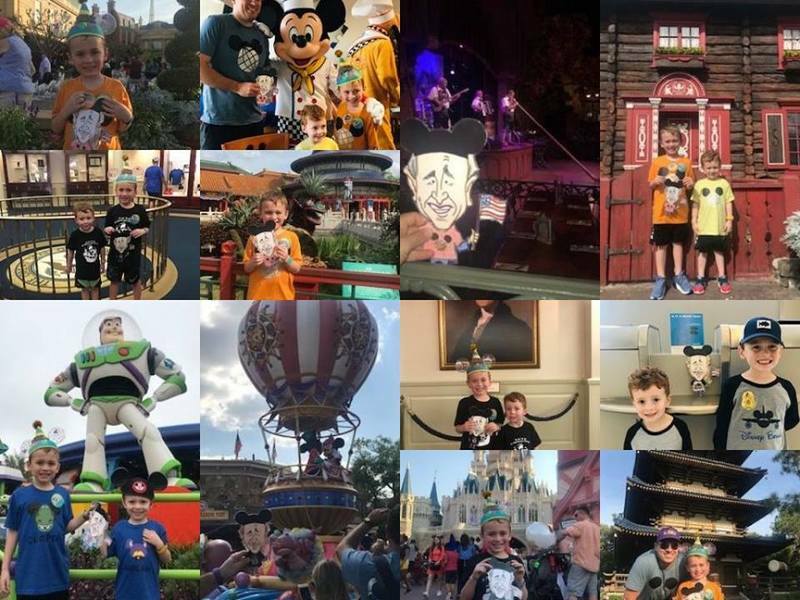 We will continue to publish all of the fun places George has visited with our friends! We would also like to thank our sponsors: Museum of the Southwest - Midland, Texas, Petroleum Museum, Old Miners Maze Family Park, Cinergy Entertainment, Susie's South Forty Confections, Inc., & Midland RockHounds for their contributions to our prize baskets! Now.. the moment you have all been waiting for..
George that traveled the furthest from Midland winner is Meghan! George that traveled to the most places in Midland winners are the Johnston kids! And Facebook's Choice winners are Cooper and Nolan! Congratulations friends! All contestants please check your emails for some exciting details! If you're interested in volunteering with the George W. Bush Childhood Home, call 432.685.1112, email at gwbhome@bushchildhoodhome.org or simply stop by. 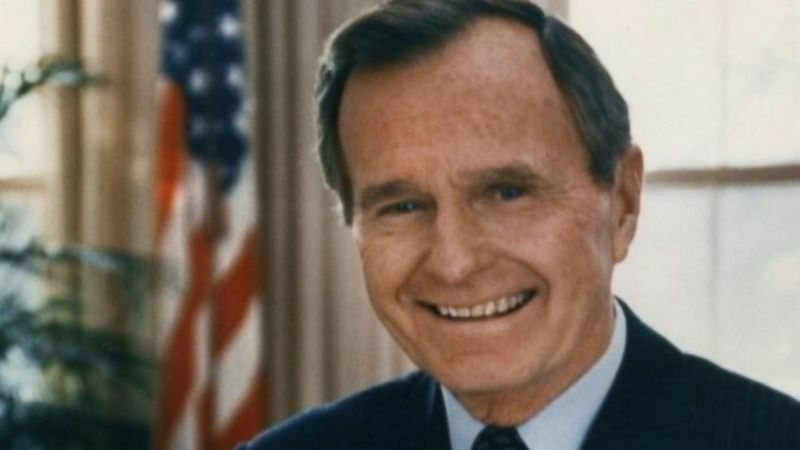 Today, we are saddened by the news that the 41st president of the United States, George H. W. Bush, passed away in Houston, Texas yesterday. The former president exemplified the values that so many Americans hold dear. He believed in making a difference by serving others whether it was as a naval aviator, elected official, husband or father. The United States of America has lost a man who exemplified in every way, the character of its greatest generation. The former President is a national treasure, and the goal of the George W. Bush Childhood Home is to preserve his legacy, and the legacy of his family, for the benefit of the generations to come. In memory of one of America's greatest leaders, the board of directors and staff of the George W. Bush Childhood Home will have a large banner available in the Visitor Center where the public will have the opportunity to express their condolences which will be sent to the Bush family. The public is invited to come by during normal business hours between Saturday, December 1st and Wednesday, December 5th. American flags will be given to all while supplies last. Our thoughts and prayers are with the entire Bush family. Volunteers are needed! We're gearing up for our busy spring and summer season. 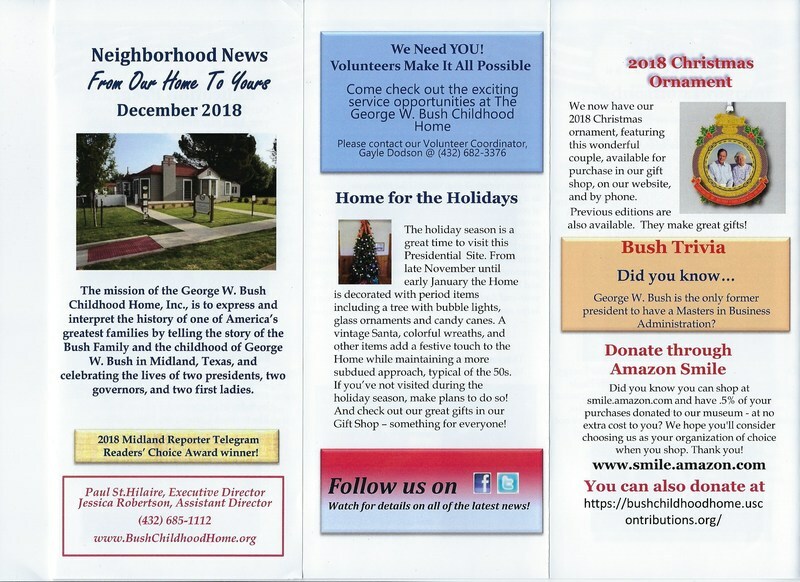 The George W. Bush Childhood Home is a 501(c)(3) non-profit and relies on caring and giving volunteers to run our gift shop and provide guided tours of the historic home. Volunteer's schedules are very flexible. You can work a 3 hour shift once a week, every other week or once a month, depending on your availability. If you are looking for a fun way to meet people from around the world and some occasional dignitaries, please consider helping us preserve this unique presidential site and help our visitors take a trip back in time. Help us share Midland's Heritage! email us at gwbhome@bushchildhoodhome.org or call volunteer coordinator, Gayle Dodson, 432-528-2157 if you are interested. Smile.Amazon.com - an easy way to donate at no cost to you! Did you know you can shop at smile.amazon.com and have .5% of your purchases donated to our museum - at no extra cost to you? We hope you'll consider choosing us as your organization of choice when you shop. Thank you. "Third Thursday Reading Program" Staff members read several short stories of interest to children. These periodic events are held in our Visitor Center and attendees are provided refreshments. These programs are from 4:30 - 5:30 PM and open to children of all ages. 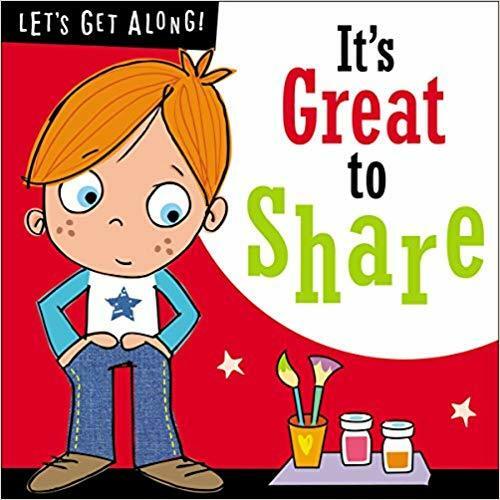 Children also get to take home a free copy of the feature book. 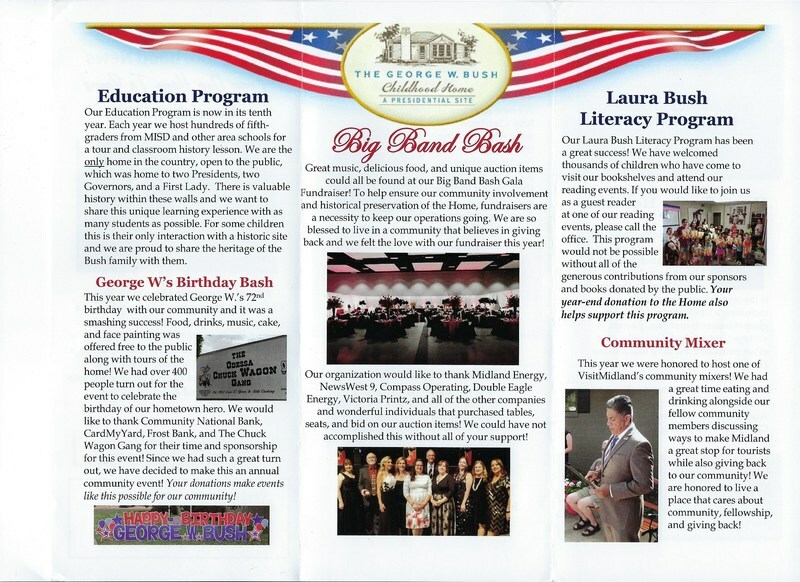 "The Laura Bush Bookshelves" Children's books are available, free of charge, to all children. Books will be available in our Visitor Center and can be picked up during our normal business hours. In order to make this a success we are asking for your help. Because of growing demand, our book supplies have dwindled, especially in the Pre-K section. Board books and tactile books for babies and toddlers are in big demand. We are asking the public for donations of new or gently used books for children of all ages. Please drop off your donations at our Gift Shop. We can arrange to pick up large volumes of books if you are unable to deliver them. Please call 685-1112 to make arrangements for pick-up. Please help us keep the joy of reading alive in our children! We would like to publicly thank a couple of fine gentlemen for their help in getting a 1949 Hoffman TV, the same model that the Bush family owned while living in this house. Newton Shrader found the TV for us and the owner, Eric Hill, donated the TV to us. Thank you for helping us make this Home as historically accurate as possible! The TV is currently on display! Please help us find a set of 1950 Westinghouse washer and dryer. Check out our weekly ads in the "Pulse" section of the Midland Reprter Telegram every Thursday. Become a fan of the George W. Bush Childhood Home.